How can planning open itself up to the unplanned? … can the unplanned be planned, the informal formalized? Urban design – the shaping of public space – is the most permanent of built environment practices, much more than buildings and plans that are demolished or abandoned with economic and political cycles. It is also the case, however, that many aspects of urban form change on a temporary basis and a great deal of the potential for urban intensity involves the exploitation of both the temporal and spatial interstices of the city. Such interim and interstitial practices are generally also incremental and tactical in the sense that they squeeze between and within larger-scale strategies. When I was a student at Berkeley in the 1980s the Vegetable Car (Fig. 27.1) was often parked on my street as a memorial to the first person to die in a car accident. Designed by an eco-activist group known as Urban Ecology, it was towed every few weeks to a new location in order to evade local by-laws about abandoned cars (Downton 2009: 95). 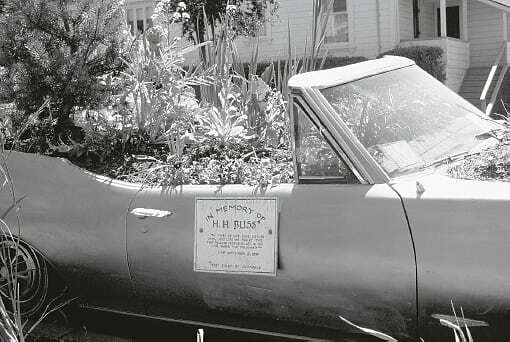 This was an early version of what has become known as ‘guerrilla gardening’ and a precursor to the ‘parklets’ that emerged in San Francisco in the early 2000s, which have since morphed into a formally authorized ‘Pavements to Parks’ programme. There is now a pervasive global trend towards the temporary and the tactical that has become one of the key urban design strategies of the twenty-first century. Such projects range from guerrilla gardens, crosswalks, parklets and bike lanes through to more formalized temporary beaches and swimming pools, parklets, parkmobiles, instant plazas, pop-up buildings, food trucks, outdoor theatres and container towns (Temel and Haydn 2006). This emerging field of practices is difficult to define but can be described as an intersection of the temporary and the tactical, or the interim and the interstitial. It is variously termed ‘temporary urbanism’ (Bishop and Williams 2012), ‘insurgent urbanism’ (Hou 2010), ‘urban catalyst’ (Oswalt, Overmeyer and Misselwitz 2013), ‘tactical urbanism’ (Lydon and Garcia 2015), ‘austerity urbanism’ (Tonkiss 2013), ‘sandpit urbanism’ (Stevens 2015), ‘DIY urban design’ (Fabian and Samson 2015), ‘pop-up urbanism’ and ‘guerrilla urbanism’. This is a broad field of incremental urban transformations that fill interim periods of time and underutilized urban space – the vacuums, terrain vague and smooth urban spaces of the city. They are often cyclic, taking advantage of urban rhythms – the daily, weekly and seasonal rhythms that produce times of underuse, or the economic downturns that yield cheap or vacant space. The idea of tactical urbanism links to the work of Certeau where a tactic is an action that takes place within a context that may be antithetical: ‘The space of the tactic is the space of the other’ (Certeau 1984: 37). Tactical urbanism is a poaching operation, a form of encroachment; tactics infiltrate strategic systems. But tactics are also productive in that they seek to discover and create potentials and possibilities out of latent capacities. Tactics are linked to what Colin McFarlane (2011a: 54–7) calls tactical learning – the use of everyday practical knowledge as part of an engagement with the city as a learning assemblage. Temporary/tactical urbanism often involves the design of semi-fixed elements of public space that have long been recognized as central in human-environment studies (Hall 1966; Rapoport 1982), extending the adaptability to temporary buildings and landscapes as well as furniture and vehicles. While the focus here is on public space, such practices are often initiated in quasi-public space, especially vacant lots and buildings. The temporariness often applies to urban codes and regulations such that different practices are permitted for a limited period of time. However, tactical urbanism also encompasses informal practices of guerrilla urbanism that operate outside state control. While temporary transformations terminate by definition, they don’t always revert to the pre-existing form but may morph into something new. Many forms of transformation are cyclic in that the forms are temporary but there is a repetition or a refrain to which the city returns – informal trading is a good example. In many cases a temporary transformation becomes permanent over time. Temporary/tactical urbanism works within the existing urban infrastructure, adapting and transforming existing types such as car parks, containers, vehicles and trees; it works within, around and against existing practices and regulations. There is much to admire in many of these temporary projects – pioneering enterprise, social commitment, a spirit of adaptation, exploitation of new materials and technologies, and urban greening strategies (Bishop and Williams 2012). This is a call to understand the city as a place under constant revision with room to move and space for the unexpected: where temporary opportunities are taken with high levels of creative community engagement and design collaboration. There is little that is new about temporary or tactical urbanism. 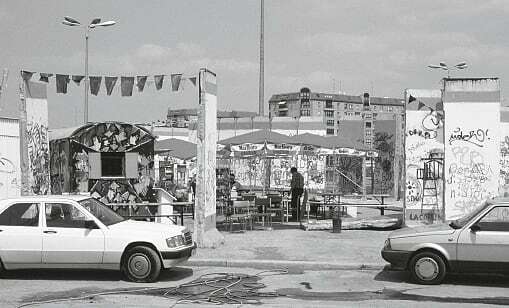 Many of the issues and concepts I have dealt with in this book – the self-organized, smooth, informal and rhizomic are all interim, incremental and interstitial; urban drama, political resistance, graffiti, advertising, street trading and informal settlement are relatively tactical and temporary practices. Traditional cyclic events such as the circus, farmers’ markets, street fairs and community gardens are all temporary. What is new is the degree to which the focus on the tactical and temporary is becoming organized into the deliberate design of a four-dimensional city. There is a range of economic, technological and social forces that has led to an expansion of temporary urbanism: spatial vacuums are produced by the downturn of investment cycles; new social media create marketing opportunities for pop-up events; flexible work patterns and community activism produce a more adaptive and opportunistic urban life (Bishop and Williams 2012). This is a movement that celebrates the city as a dynamic space of possibility and becoming rather than a static sense of being. The irony is that such approaches to urban design often succeed to the degree that the tactical becomes strategic and the temporary becomes permanent; incremental change accumulates into urban transformation. The range of project types that might be included here depends on the definition of the field, I suggest it is useful to restrict it to those that involve a redesign of public space. 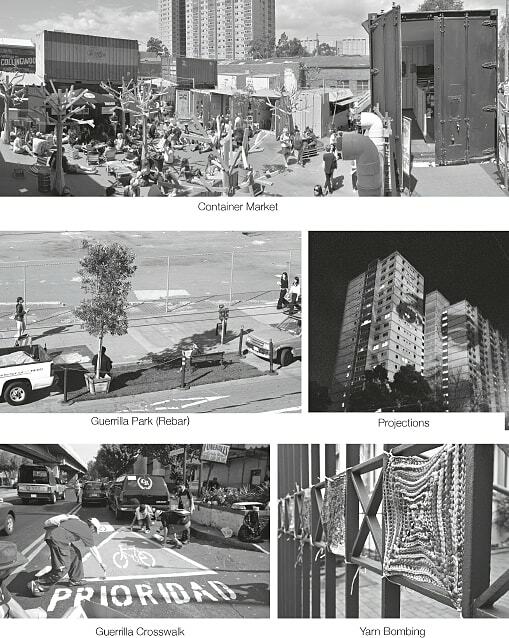 Within this definition temporary and tactical projects range from those that temporarily transform the image of the city through a range of smaller projects that also appropriate public or quasi-public space in various ways (Fig. 27.2). Such smaller projects can then become bundled into larger-scale projects on vacant lots and post-industrial sites with varying levels of strategy and permanence (Oswalt et al. 2013; Bishop and Williams 2012). At the smallest scale, many forms of temporary urbanism involve a change of image without changing the use of public space. Graffiti and advertising are the more traditional forms as are spontaneous memorials and urban artworks. Yarn bombing is a guerrilla activity that is deployed to transform meanings, to decorate and soften the city in a temporary manner. Guerrilla signage and nocturnal projections onto buildings are similar examples that change the form and meaning of the city, producing new narratives and layers of transparency. Street art metastacizes into a hundred forms. Guerrilla gardening involves a range of tactics, including the planting of trees and gardens in public space and the grafting of fruit branches onto street trees to render them productive. Guerrilla bike lanes and pedestrian crossings involve spontaneous inscriptions on roadways, undermining and augmenting the formal urban code. Chair bombing involves the design and placement of new public seating, often combined with paving and other furniture to create public living rooms. Many forms of temporary urbanism are mobile in the sense that they are easily and quickly moved from place to place. The concept of the ‘pop-up’ is now a rather overused and misused term but effectively defines a temporary building or occupation that soon pops down again. The use of shipping containers involves a transfer of technology from transport industries to temporary urban design. Parklets are small parks that originated in San Francisco with the temporary appropriation of parking bays with minimal designs of seats and artificial turf while feeding the metre. This was a tactic by the urban design firm Rebar, to reclaim the city for cars, undermine the car-parking strategies of local governance and play on the double meaning of ‘park’. This tactic has grown and developed in two main ways. First it became a global movement known as Park(ing) Day when people across the globe were encouraged to spontaneously appropriate a parking space for the day. 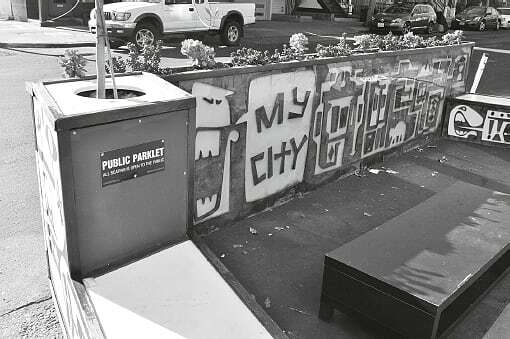 Second, in some cities and particularly San Francisco, it has developed into a formally authorized programme known as ‘Pavements to Parks’ where local residents or businesses can apply to develop and host a parklet on one or two parking bays which then becomes semi-permanent. These parklets are sponsored, funded and maintained by local businesses or residents; they often add value as outdoor seating or a change of image, but they remain legally public spaces – the required signage says ‘all seating is open to the public’ (Fig. 27.3). A variation of the parklet is the ‘parkmobile’ – an assemblage of plants and seats that can be transported from place to place as an instant park, often sized to fit a parking bay. The urban beach is a form of temporary urbanism that seeks to bring the atmosphere of the beach into the city during the summer months. Paris Plages is a waterfront freeway in Paris that is closed during summer (when traffic is quiet) and paved with sand (Stevens and Ambler 2010) (Fig. 27.4). The urban beach can be augmented with temporary swimming pools, either floated into place or containers filled with water. Larger-scale projects are often located on large post-industrial sites, vacant lots and buildings. These are often bundles of smaller projects and functions that include neighbourhood parks, community gardens/orchards, cafes/shops, artist studios, temporary cinemas, cultural facilities and exhibition spaces (Oswalt et al. 2013). As a means of understanding this field of temporary/tactical urbanism, Fig. 27.5 diagrams this range of urban design practices according to two primary axes. The horizontal axis is represents the degree to which such practices are temporary and/or tactical (left) and the degree to which they can become permanent and strategic (right). The vertical axis distinguishes between practices that transform the two-dimensional image of public space (such as wall projections, signage and graffiti) and those that also appropriate three-dimensional usage of public space (beaches, parks, containers and gardens). While all tactical/temporary urbanism begins on the left, many such practices are in a process of becoming more permanent and strategic, represented by the arrows. 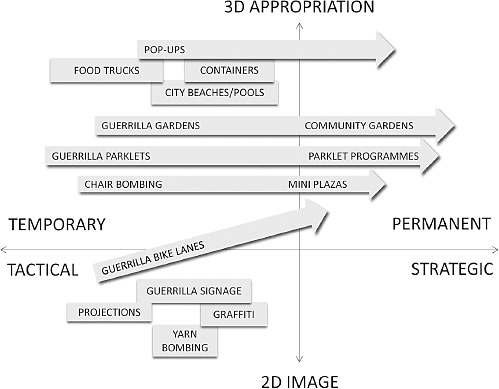 The diagram thus distinguishes between those practices that may become cyclic or seasonal but not permanent (such as graffiti, food trucks, beaches and projections) and those that often embody the desire to become permanent (such as parklets, gardens, pop-ups and bike lanes). Such practices enable different forms of social and artistic expression that are otherwise repressed in the overdetermined city. By enabling greater use of underutilized space, they make urban space more productive and get more value out of the same infrastructure. They add intensity to the city through a greater diversity and adaptation of use and meaning plus a greater density of interaction. Temporary/tactical urbanism enables a much higher level of creativity and innovation in urban design, because it turns the city into a testing ground where new forms of thinking can be implemented without the danger of permanent failure. The temporary framework is a key to bypassing the formal planning processes that are necessary to secure approval for permanent change: because the change is temporary, a higher level of innovation is seen as legitimate. Temporary/tactical urbanism grants designers the freedom to fail. Urban design is not a science and the city does not have the controlled conditions of a laboratory; yet our cities are littered with the permanent remains of failed urban design experiments based on flawed thinking. A temporary framework enables us to increase the range of experimentation and speed up the learning process. The city is simply too complex and unpredictable to enable the approval of every smart idea that comes along. Temporary/tactical urbanism is a means of breaking down urban design to an incremental scale that enables us to bypass the status quo; but again the irony is that it embodies a strategy to become the status quo. Temporary urbanism can stimulate markets, change the place identity of rundown neighbourhoods and reactivate vacant sites. There is spin-off value for developers as interim uses add value, prevent squatting and pave the way for permanent projects (Bishop and Williams 2012). Temporary/tactical urbanism also plays a key role in incrementally reclaiming the city back from the car. 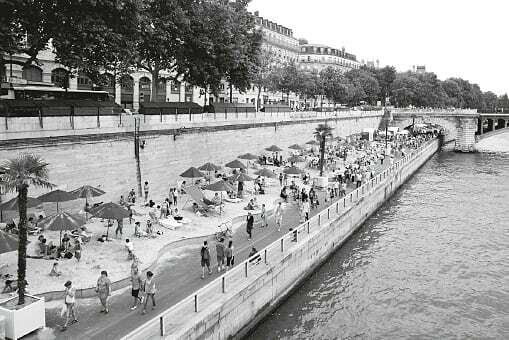 The freeway lining the River Seine that enables the Paris Plages beach during summer would never be built today and the beach demonstrates what might have been possible if it had not been built. The success of the temporary beach calls the permanence of the freeway into question – why does the car hold a monopoly on this riverside space? Tactical urbanism then involves a testing of the legitimacy of the ways the city has been designed and what it might become. The power of temporary and tactical urbanism is that it shifts the ontology of the city from being towards becoming; it opens a space of possibility. One framework for understanding temporary/tactical urbanism stems from the work of Bruno Latour (2005) and is generally known as actor-network theory. This is an approach that treats the world as a human-environment assemblage where both human and non-human elements have agency. For Latour anything that modifies a state of affairs is an actor, or to use the jargon, an ‘actant’: just as people act, so trees shelter, gates open and close, timetables and traffic signals regulate flows. ‘Every time you want to know what a non-human does, simply imagine what other humans or other non-humans would have to do were this character not present’ (Latour 1992: 229). Actor-network theory removes intention from agency in order to look at the human-environment assemblage as an interactive network of both human and non-human actants (Bender 2010). A key form of non-human actant is the ‘immutable mobile’ – technologies that can’t be changed but that can be moved easily from place to place and plugged into different contexts, where they recombine with other technologies and practices – automatic doors, traffic signals, mobile phones and food trucks are examples (Latour 1987). From this perspective Guggenheim (2010: 175) suggests that the city is in many ways the opposite of the immutable mobile – we can change it but we can’t move it: ‘The very idea of a city consists in an assemblage of mutable immobiles.’ Mutability is the adaptability of the city, its capacity to reform and recombine into new forms of co-functioning. Temporary and tactical urbanism exploits this mutability of the city, the micropractices of everyday urban life, the city as a human-environment assemblage of affordances and semi-fixed elements, the network of actants. Peter Bishop and Leslie Williams (2012) argue that while policy and governance cannot directly create many forms of temporary urbanism, it can play a key enabling role: conservation codes that protect post-industrial shells, publishing databases of vacant properties, leasing state-owned properties for temporary use, and seed funding for events and organizations. They also call for more flexible forms of urban planning that incorporate temporary projects – alternatives to the traditional masterplan in favour of phased development without a fixed end-state, with small grain adaptability and short time cycles. Such planning promotes general visions rather than idealized end states; it aims to be implementable through flexible phasing, an open time frame that can respond to changing conditions (Bishop and Williams 2012). Temporary/tactical urbanism is at once a violation of rules and a production of new rules; it involves a double movement of both informalizing the formal city and formalizing the informal city (Christiaanse 2013; Sassen 2013). There are interesting interconnections with the formalization of informal settlements; both are forms of relatively informal urbanism that fill the interstices of uneven urban development with adaptive small-scale projects. While one adds vitality to the poorer quarters of overdetermined rich cities of the global north, the other has become a permanent part of poorer cities of the global south. Another key question that emerges here is the degree to which temporary urbanism is a temporary function of economic downturn or the harbinger of a more permanently dynamic urbanism. Is this just a matter of artists and activists collaborating with out-of-work architects and urbanists to fill the gaps created by capital markets as an interim between permanent projects? I suggest it is both – filling gaps and driven by new markets. On the one hand it is clear that temporary urbanism is geared to the failures of market capitalism: particularly high rates of vacancy and dereliction. It is a response to the polarizing effects of neoliberal urbanisation that turns the city into islands of luxury in a sea of leftover space. As Sassen (2013: 116) puts it: ‘informal activity is not the failure of regulation or a return to older modes … it is part of advanced capitalism’. Opportunities are also created by major geopolitical ructions. Soon after the fall of the Berlin Wall a temporary open-air cafe was set up near Potsdamer Platz with scattered wall segments as the key attraction (Fig. 27.6). A hammer and chisel could be hired from the pop-up van to souvenir a piece of the wall and contribute to its demolition. A more permanent example nearby involves the struggle for re-use of the former East German parliament building (Oswalt et al. 2013: 288–303). The demand side of temporary urbanism is linked to the ways it creates a word-of-mouth ‘buzz’ based on the demand for the new and unique. A pop-up event gains symbolic capital because one needs to catch it before it pops down – lack of enduring supply creates demand. Urban events are increasingly used to generate brand identity for both places and products; it can become difficult to distinguish creative temporary urbanism from a camouflaged marketing campaign. The term ‘pop-up’ is used as marketing discourse to create buzz around the idea of the temporary – such pop-ups often don’t pop-down. The Berlin-based collaborative known as Urban Catalyst have documented a range of processes through which temporary uses are implemented, co-exist with other uses and may or may not become permanent in different ways (Oswalt et al. 2013). A temporary project may simply occupy an underutilized site during an interim period of vacancy with little long-term impact. The same bundle of forms and functions may then flow from site to site, filling the gaps of the property market – the temporary becomes permanent but mobile. The temporary can fire the urban imagination and become an impulse for other uses that utilize similar sites or tactics. If the temporary use is successful, it may be permitted to co-exist with its replacement and operate in synergy with the long-term use. In some cases the temporary use displaces the existing use and becomes permanent. This is a rhizomic global urbanism that spreads primarily through websites; a temporary use in one site or city may become permanent in another. The temporary and the tactical are forms of urbanism that augment the permanent and the strategic, and also have a tendency to become more permanent and strategic. They are particularly useful in filling temporal and spatial vacuums, taking advantage of opportunities produced by politics and markets. They represent a key cutting edge of the democratizing movement broadly known as the right to the city. The temporary and tactical often emerge as self-organized guerrilla tactics and can produce a very makeshift aesthetic image (Fig. 27.6). While it is impossible to defend the design quality in many cases – tactical urbanism is self-organized and irregular by definition. Design quality emerges from a culture of creativity that will determine that poor designs will be very temporary. The larger questions remain: how to plan for the unplanned, how to regulate for difference, how to design for the unpredictable, and how to organize for self-organization.